It's the most wonderful, hard, painful, sorrowful, worst time of the year. Twelve Christmases have come and gone without you - my best friend, my soul mate, my husband and the father to the three most amazing children I have ever known (who I am somehow lucky enough to call my own)! But the feeling of this time of year doesn't start the day after Thanksgiving for me. It's really with me all year long and slowly grows until I miss you so much I can hardly breathe. Every fall I feel it coming. The kids are back in school and I am left at home alone. They come home and tell me about their days, but you are always missing – not there to listen or be a part of their stories. Then comes my birthday, Lauren's birthday, our anniversary, Halloween, Thanksgiving and, finally, the Christmas season begins. December 7th comes and I relive the anniversary of your death all over again. I hear the doorbell ring and see the kids run to the door. Who in the world would be ringing my doorbell at 9am? Men in uniform. They must be here to get me to notify a family of their fallen hero. I am the Family Readiness Group leader so that family will need me for support. Wait, what are they saying? It can't be for ME! This can't be ME!? 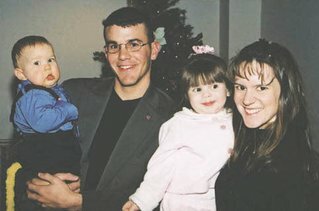 The Stubenhofer family. Every December 7th, I am reminded of all those things all over again. Yet another year has been added, another year of memories fading away, another year of new memories that were made without you. But I have to somehow summon up the strength to get out of bed just as I did 12 years ago and every day since. I have to put on a happy smile and celebrate the Christmas season – a time of year when the world becomes peaceful and happy and everyone is supposed to be thankful for all that they have in their life. And I am so very thankful for everything that I have, but my heart is so heavy it's hard to see it sometimes. Everything I do and everything around me reminds me of you and all that you –and we – have missed. I love how much you loved Christmas and I hate how in an instant I suddenly dread this time of year. I see you in the house (even though you've never lived here) putting up the lights. I hear you in a Christmas song that makes me wish you were here ("Merry Christmas, Darling" gets to me every time). I see you picking out presents and setting them under the tree. I see you taking the kids to see Santa and being so excited to see their faces Christmas morning. I even see you excited for Christmas Eve Mass and feel your guilt when we are always late and standing in the back. I avoid shopping in the stores now because I see you there too. I can't buy you any presents – even though I know what you would really like – and it's too hard to just walk on by. I see the dads picking up their kids as they walk through the store and I'm sad because mine didn't get that feeling of being secure in dad's arms. And I feel you give me strength when I hear other moms complain about how busy they are or about how their husband doesn't help or are doing something wrong or how hard it is to get the kids where they need to be on time. I know I used to be one of them, but now I just wish you were here even to complain about. I see you at the Christmas parties (when I'm invited because it's still awkward for me to be there by myself) talking with your friends and wondering what new friends you would have. I know they would all like you. The worst and best part, though, is I see you in the kids. Justin is so much like you that it's hard to look at him sometimes. As he grows, I see more and more of you every day – from the simple way he walks to the stories that drag on for days because of the tremendous amount of detail and how he can win any argument even if he is wrong. I see you when he worries about everything and everyone and just wants the world to get along and wants to do something about it. Lauren has an endless amount of useless facts floating around in her head and, just like I did with you, I wonder how the heck she knows that stuff. I see you in her love for life and determination to follow her dreams – you'll be seeing her on Broadway someday, I just know it. And Hope is a handful with lots of spirit. She knows what she wants and won't let anyone (including me) tell her no. 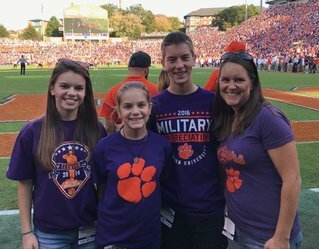 Lauren, Hope, Justin and Patty Stubenhofer. So when they wake up on Christmas morning and wait up at the top of the stairs for me to turn on the lights on the tree – just like you use to – and when I see that empty chair at the dinner table and carve the turkey myself, or take twist ties out of toy packages ALL day long, when I see the joy that Christmas has brought to my family – I'm reminded how lucky I am to have loved you, to love you still and how grateful I am for all the love you have given me. I've spent more years missing you than I spent with you but the love is always there and I see it in my children's eyes, their hugs and their love every day. Even though we only had a little while together, I am forever thankful for every minute of it and long for just one minute more. It's not just the holidays when I miss you though. It's the 12+ dance recitals, the 240+ baseballs games, the bike riding lessons now turned into driving lessons, learning to swim, vacations to Disney World and Clemson football games, endless cookouts and being with friends, those days of just laying around or playing with the kids, the smiles, the heartbreaks, the worries, the excitement and the joys that life has to offer that haven't been the same without you. What I miss most are the times holding your hand, feeling you breathe, seeing your smile, hearing you say "I love you" and the 4,380 kisses good night I didn't get. 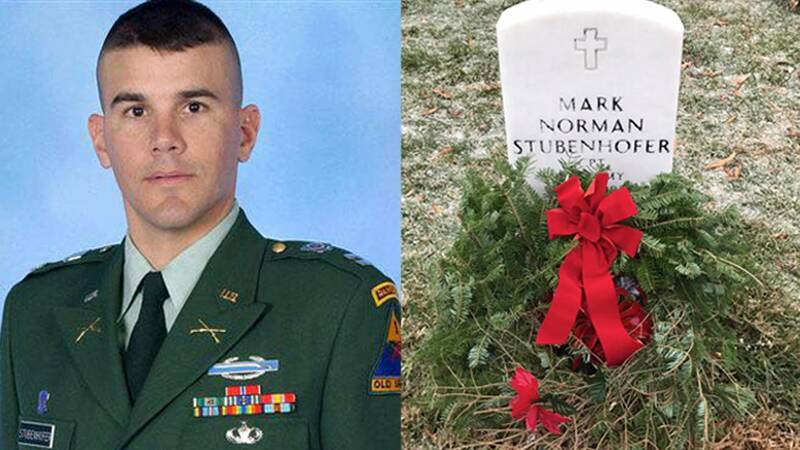 To learn more about Mark Stubenhofer, visit his personal page on the Arlington National Cemetery website. 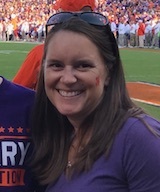 Patty Stubenhofer is from Nokesville, VA where she lives with her 3 children. She currently works part-time as a dog walker with dreams of opening her own pet resort someday and spends most of her time volunteering at the kids' schools and activities.